I couldn't decide whether to call this a salsa or a salad. Ultimately, I think it could be either, depending on how you eat it. Dump it on lettuce and add some meat or cheese or nuts and it's a salad. Use a chip as your vehicle for consumption and it's a salsa. A third option is to serve it just as is on the side, which I did when I made that outstanding slow-cooked pork shoulder. Any way you get it into your mouth, it's tasty, fresh, full of textures, and quite nutritious. *Well, there was that one time that I used canned corn, and it's a mistake I shall never repeat--there was an off-flavor that ruined the whole dish. In a large bowl, combine all the ingredients and mix well. Adjust seasonings and sweetness to taste. Refrigerate an hour or so before serving. Salad or salsa - saladsa sounds like the perfect name! Very versatile indeed, this looks awesome! I have never thought to grow black beans nor do I know anyone (to the best of my knowledge) that has. What an interesting thought. I'm going to stick to the canned variety, but I am curious how your experimentation goes. Keep us posted! I actually like salsa on top of a green salad. So this is ideal for me! Growing black beans sounds quite a challenge for me. I am quite happy with the dried one now. The salad looks very fresh and delicious, Grace. We have lettuce coming out of the garden like crazy right now, so I was thrilled to see your idea. I make a similar bean salad, and never considered having it with lettuce. I will be now! And.... nope... Never tried growing black beans. Green only... and purple this year! I am loving your blog, from one gardener to another! We were picking lettuce like crazy a few weeks ago! I found that wrapping them in foil and sticking them in the fridge makes them last for weeks, it was life changing. Black beans are easy to grow and fun to shake once they're dry! I have a post from last Summer about growing them if you want to check it out! I am going to call it a salsa, because I can see myself scooping it up with tortilla chips right now! This looks so god! I order a salad sort of like this at a local restaurant. I can't wait to try this one at home! So great for summer! Perfect for summer! Looks so good! Can't wait to try one! I'll tell you it looks delicious, whatever you call it. Perfect use of corn and beans, for sure. Thanks for sharing! Growing black beans? I will be soooo impressed if you try it another year. Keep us posted. Don't know that I've ever read or know anyone who's done that. I love your salsalad. I'd eat it right out of the container. Ooooh. This will be a great addition to a pick food dinner/barbeque! 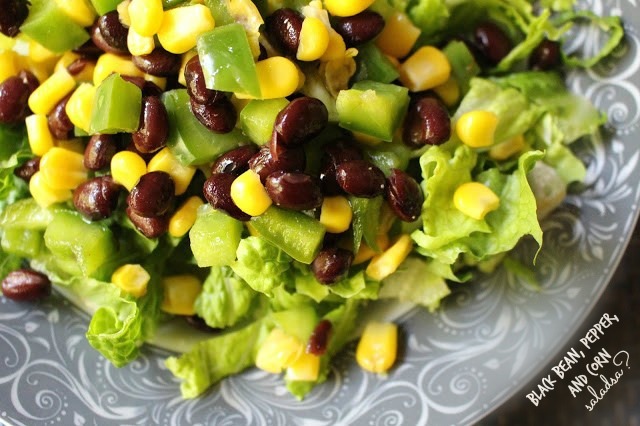 This is a great salad to make when we do a BBQ. Looks so good. What a great versatile salad or salsa. You can add all the things you like.